Despite a change of guard in Washington, the India-US global strategic partnership remained strong as ever. NEW DELHI: Though the personal chemistry between Prime Minister Narendra Modi and new US President Donald Trump was the highlight of India-US ties in 2017, what has come as a huge boost to bilateral relations towards the end of the year is the key strategic geopolitical role for India in the new US security strategy. At the same time, New Delhi made it clear that its foreign policy remains independent when it went with the rest of the world in voting in the UN General Assembly against Trump's decision to recognise Jerusalem as the capital of Israel. 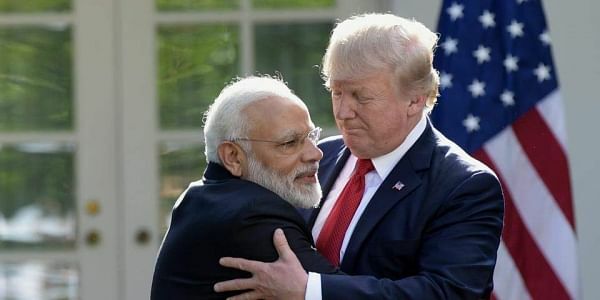 Despite a change of guard in Washington, the India-US global strategic partnership remained strong as ever and a warm hug marked the first-ever meeting between Modi and Trump at the White House in June this year. While Trump said that bilateral ties have "never been stronger", Modi said that both the countries were "committed to such a bilateral architecture that will take our strategic partnership to new heights". According to a joint statement, the two leaders "resolved to expand and deepen the strategic partnership between the countries and advance common objectives". "President Trump and Prime Minister Modi expressed confidence that, together, the United States and India will provide strong leadership to address global challenges and build prosperity for their citizens in the decades to come," the statement said. And that is exactly what got reflected in the New Security Strategy (NSS) that Trump announced this month that sees India being mentioned no less than seven times. "We welcome India's emergence as a leading global power and stronger strategic and defence partner," the NSS states. "We will seek to increase quadrilateral cooperation with Japan, Australia, and India." This comes in the wake of the meeting between officials of India, the US, Japan and Australia in the Philippines last month in which the security and prosperity of the Indo-Pacific region were discussed. "We will expand our defence and security cooperation with India, a Major Defence Partner of the United States, and support India's growing relationships throughout the region," the NSS states. It says that the US would "deepen our strategic partnership with India and support its leadership role in Indian Ocean security and throughout the broader region". And what will come as music to New Delhi's ears is the reference to Pakistan from the perspective of terrorism. "We will press Pakistan to intensify its counter-terrorism efforts, since no partnership can survive a country's support for militants and terrorists who target a partner's own service members and officials," the NSS states. It also states that the US would encourage India to increase its economic assistance in the region. Trump continued with his praise of Modi at the Asia Pacific Economic Cooperation (APEC) Summit in Vietnam last month where he said that the Indian leader was working to bring his country and its people together. Soon after this, Trump and Modi again met on the sidelines of the ASEAN and East Asia Summits in the Philippines, a meeting that was described as "warm and productive". Modi-Trump bonhomie apart, high-level visits continued between the two sides throughout the year. After the Indian leader's visit to Washington in June, both US Defense Secretary Jim Mattis and Secretary of State Rex Tillerson visited India. From the Indian side, Finance Minister Arun Jaitley, then Commerce and Industry Minister Suresh Prabhu and Minister for Petroleum and Natural Gas Dharmendra Pradhan were among those who visited the US. Another highlight of the India-US ties this year was President Trump's announcement of a new US policy on South Asia that called for India playing a key role in the reconstruction of Afghanistan. The appointment of Kenneth Juster as the new US Ambassador in New Delhi came in for praise from all quarters. Juster is an old India hand who played a key role in the India-US civilian nuclear cooperation agreement. On its part, New Delhi, reflecting the government's tendency of keeping faith in trusted people in key diplomatic posts, extended by a year the term of Indian Ambassador to the US Navtej Sarna, who was to retire at November-end. Another highlight was the visit of President Trump's daughter Ivanka Trump to Hyderabad for the Global Entrepreneurship Summit, hosted by India for the first time. This year also saw a shipment of American crude oil arriving in India, marking the first US oil export to India in more than four decades. On the downside of the bilateral issue this year, however, was the H1-B visa issue that continues to remain prickly. Soon after taking over as President, Trump called for stricter norms for issuance of H1-B visas, largely availed of by Indian IT firms. A private member's bill was also introduced earlier this year in the US Congress by Democrat Zoe Lofgren which seeks to increase the minimum salary of an H1-B visa holder to a whopping $130,000 from the current minimum of $60,000. While Trump has spoken of restricting the H1-B visa system as part of his policy of putting Americans first, there have been no changes to it so far and for this year the same levels of 65,000 for general H1-B visas and 20,000 for those with advanced US degrees have been kept.